Heat oven to 350°F (325°F for dark or nonstick pans). Spray bottoms and sides of two 8-inch round cake pans with cooking spray. Place paper baking cup in 1 regular-size muffin cup. In large bowl, beat cake mix, oil, water, eggs, cinnamon and nutmeg with electric mixer on medium speed 2 minutes, scraping bowl occasionally. Stir in carrots. Spoon 1/4 cup batter into baking cup. Bake cupcake 15 to 20 minutes or until toothpick inserted in center comes out clean. Cool 10 minutes, then remove from pan to cool completely; remove baking cup from cupcake, and discard. Place cupcake in freezer until ready to frost. Divide remaining batter evenly between round pans (about 2 1/4 cups each). Bake 28 to 33 minutes or until toothpick inserted in center comes out clean. Cool 10 minutes. Run knife around edges to loosen. Remove from pans to cooling rack. Cool completely, about 1 hour. Frost cake rounds using 2/3 cup frosting between layers. Reserve 1/2 cup frosting in small bowl. Frost side and top with remaining frosting to cover completely. 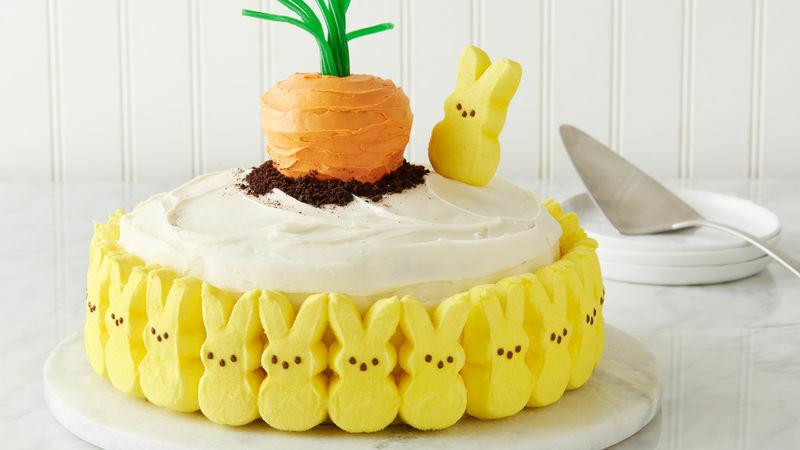 Immediately attach 22 PEEPS® bunnies around bottom edge of cake, pressing slightly to attach to cake. Add red and yellow gel food colors to reserved 1/2 cup frosting to tint orange. Remove cupcake from freezer; frost bottom half of cupcake with orange frosting, and place frosted side down in center of cake. 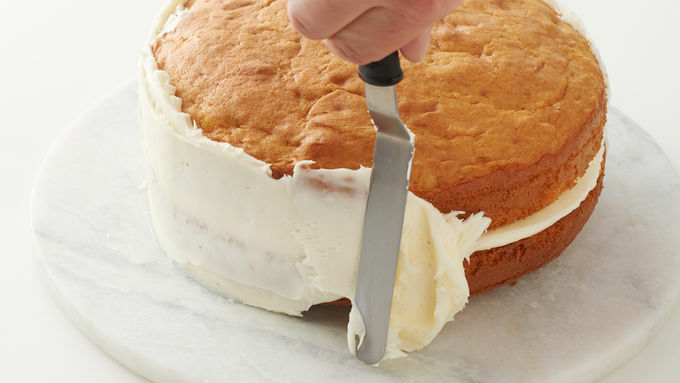 Continue frosting to cover cupcake completely. Using photo as a guide, sprinkle crushed cookie around base of frosted cupcake. Cut licorice twist in half crosswise; set aside one half for another use. Gently pull apart ends of remaining half, leaving one end intact, to look like a carrot top. Press intact end into top of cupcake to complete the carrot. 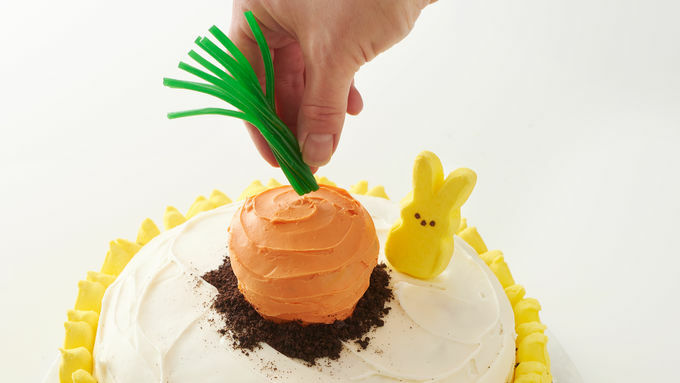 Place remaining PEEPS® bunny next to carrot. 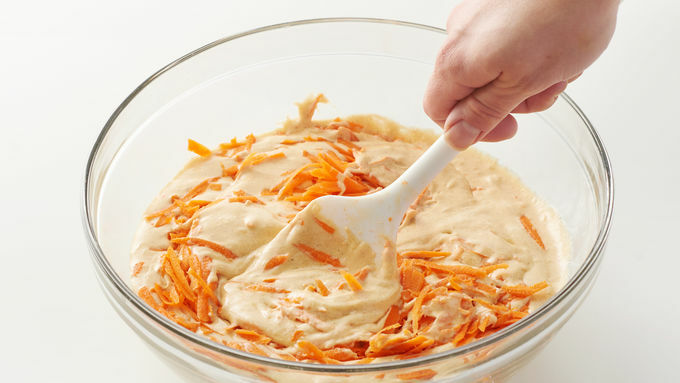 For best results, use large holes on box grater to shred carrots for your carrot cake. 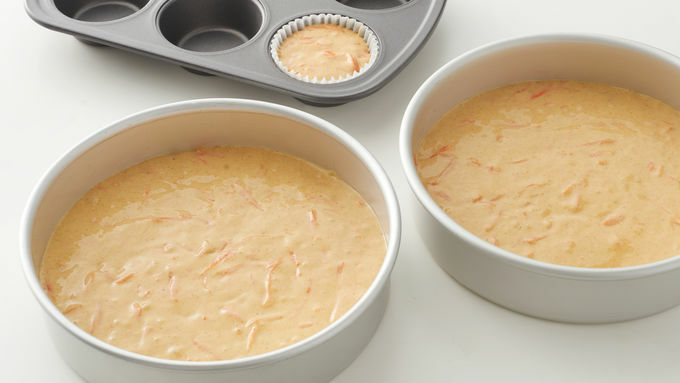 Carrots shredded coarsely (rather than finely) will result in your cake having the correct texture. 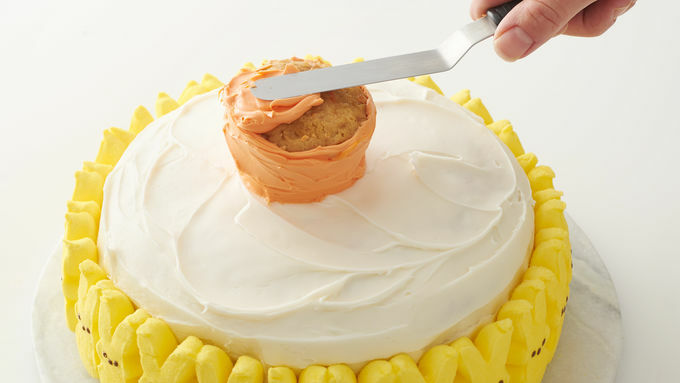 Transfer orange frosting to resealable food-storage plastic bag, and cut one corner from end. Pipe onto cupcake for ease, and finish by using an offset metal spatula to make lines or texture to look like carrot. Can’t decide who gets to eat the carrot top cupcake? Make a game out of it, and have the winning prize be the lucky carrot top cupcake!